When deciding on insulating glass, knowing some basic terms will help you understand what you are purchasing. Insulating glass refers to the two or three glazing panes separated in a unit to reduce heat flow. 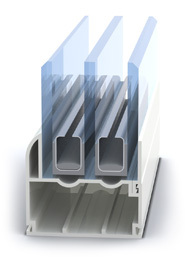 INTIGRAL’s insulating glass units can be configured with almost countless options to fit your needs. Double pane – Two pieces of glass separated by a space to reduce heat transfer. Laminated – A glass type that holds together when shattered. V-Groove – A decorative groove that is cut into the surface of the glass. Blinds Between the Glass – Blinds that are completed incase within the insulating glass unit. Tempered glass – Glass that is reheated and then quickly cooled to give it additional strength. This also causes the glass to break into small pieces. Low-Emissivity coatings – A coating applied to glass that helps reduce energy loss up to 50%. Reflective coatings – A thin, metallic coating that reduces solar radiation. The coatings most common colors are bronze, gold and silver. Learn more about glass on the Department of Energy website, along with further information on windows.